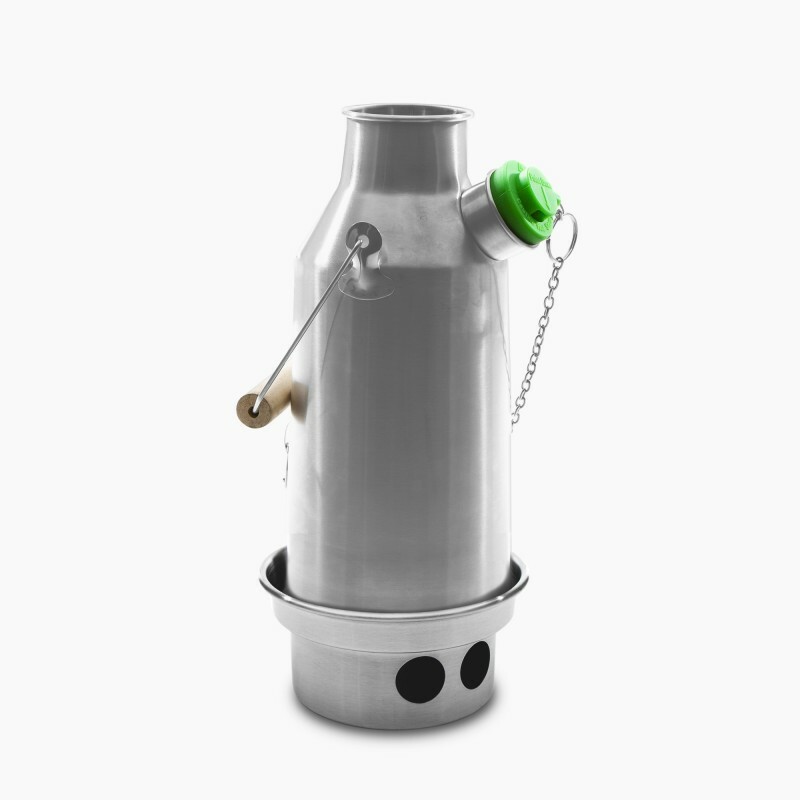 New Model 0.6ltr 'Trekker' Kettle in Stainless Steel + Steel Cook Set + Steel Pot Support + Carry Bag. Perfect for one or two people. Boils approximately 2 Mugs (600ml) of water within minutes. See Product Description below. 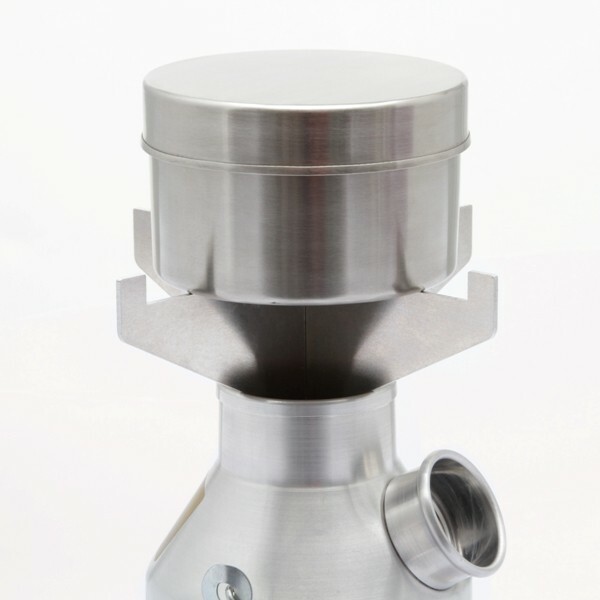 This NEW version of the kettle has an all welded construction and no rivets. A highly efficient Outdoor camping kit which is suitable for solo campers, Trekkers, Hikers, Kayakers, Backpackers, Bikers, and all outdoors enthusiasts who need to keep their pack light. A great addition to your Car Camping gear and a vital item for a Wilderness Survival Kit or Disaster kit. 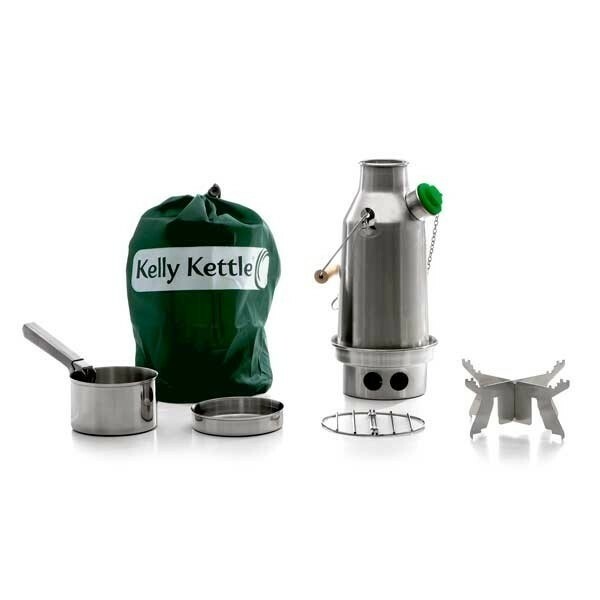 This lightweight Stainless Steel 0.6 ltr kettle + Steel cook set + Steel Pot Support all fit neatly together into their own drawstring carrying bag which can be put into or carried hanging from a Rucksack or Backpack. As there is no need to carry fuel, this camping equipment 'kit' will keep your pack light and save you money at the same time - never worry about running out of fuel again! Using any naturally occuring solid fuel (sticks, pine cones, dry camel dung! etc.) this unit will operate perfectly well, even in the most extreme weather conditions or terrain. The Kettle brings 2 Mugs of water to a rolling boil within a matter of minutes while you reheat or cook food at the same time using the cook set on the pot-support over the chimney of the kettle. In this way, a very small amount of fuel will both boil your water and cook your meal at the same time! 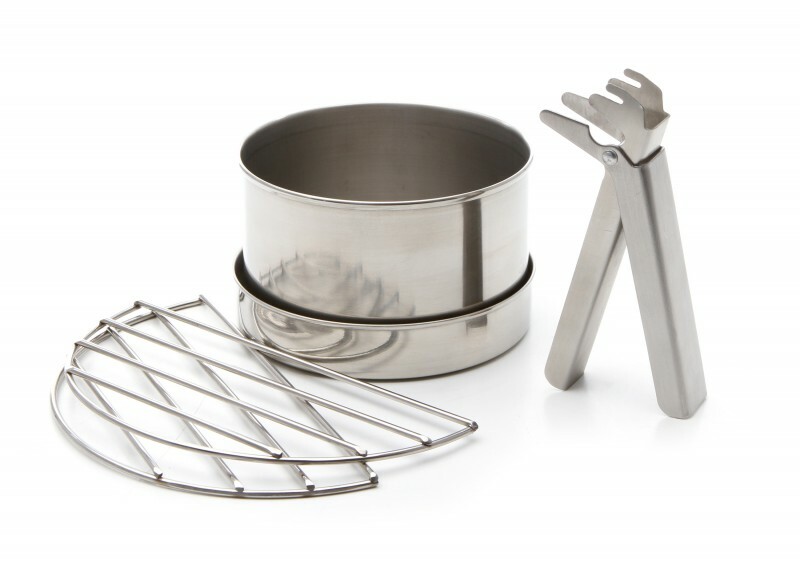 Note: the Pot-Support is suitable for use with quick cooking items such as Soup, Boil-in-the-bag, re-hydrating food, reheating etc. If more hot water is required (this kettle will easily boil water quickly for a party of 4-6 people), simply refill the kettle and place it back on the fire base and refuel the chimney again. The kettle will be boiled again within a matter of minutes where water can be used for more hot drinks, boil-in-the-bag, bathing, washing up, etc. 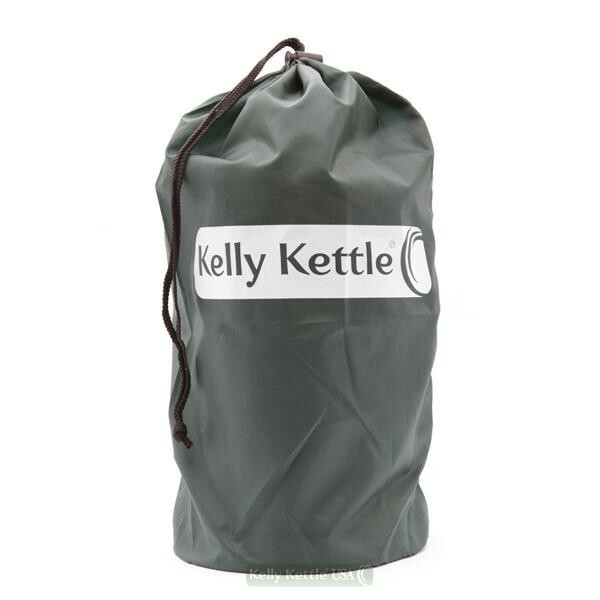 I'm a kayaker at weekends and a gardener by week and there's no time when I don't use my kelly kettle, it boils quicker than you think,is convenient to carry and always provides me with a hot cuppa. I got one to replace my broken flask on a camping trip and regret not getting one sooner.